Rising Sun Consultants offers programs and services geared toward the development of supervisors at all levels, from front line managers to Presidents and CEOs. Regardless of their level within an organization, supervisors have the greatest opportunity to impact employee engagement. Our proprietary 10 Keys to Effective Supervision™ program provides a training, mentoring and advisory platform to help supervisors at all levels advance their leadership skills, as well as improve their proficiency in employee management strategies. All too often, employees are promoted to the role of supervisor because of their strong technical or clinical expertise. However, an effective supervisory relationship requires that the supervisor not only be a content/technical expert, but that they also accept the enormous responsibility of being a coach. How many of us in our working lives have asked for a transfer, resigned from a job, or have at least pondered one of these actions because of a supervisor we did not get along with - one who did not have effective management and/or people skills? Supporting Growth - Providing support for employees personal and professional development. Uniting Your Team - Building a culture of care and concern among and between employees. Praising Others - Offering employees praise and encouragement, developing a motivational environment. Expecting Excellence - Setting high expectations for employees. Requiring Accountability - Upholding and reinforcing individual responsibility to the organization. Valuing What You Believe - Linking employee’s actions and behaviors to organizational values – building a healthy culture. Instilling Independence - Developing an atmosphere of hope, confidence and autonomy. Sharing Continuously - Establishing open and honest two-way communication. Optimizing Ownership - Creating opportunities for employee contribution and buy-in. Realigning Your Efforts - Evaluating your efforts to determine if they match your desired outcomes. Although the 10 Keys™ have been grouped to spell SUPERVISOR, it is important to note that all 10 Keys™ are of equal importance and, although all are necessary for success, they do not need to be applied in any particular order. In addition, any one of these Keys can be either underutilized or over utilized, causing a negative situation for both the organization and/or the individuals involved. It is important to remember that supervision is just one of many strategies to increase productivity, employee engagement, and a healthy organizational culture. However, research and experience clearly suggest it to be one of the most important strategies in influencing overall organizational success. From this perspective, supervision is seen not as much as a form of instruction and/or accountability, but rather, as a form of coaching and mentoring. The role of the supervisor, therefore, has less to do with teaching and evaluation and more to do with establishing an environment and culture which encourages both individual growth and development. 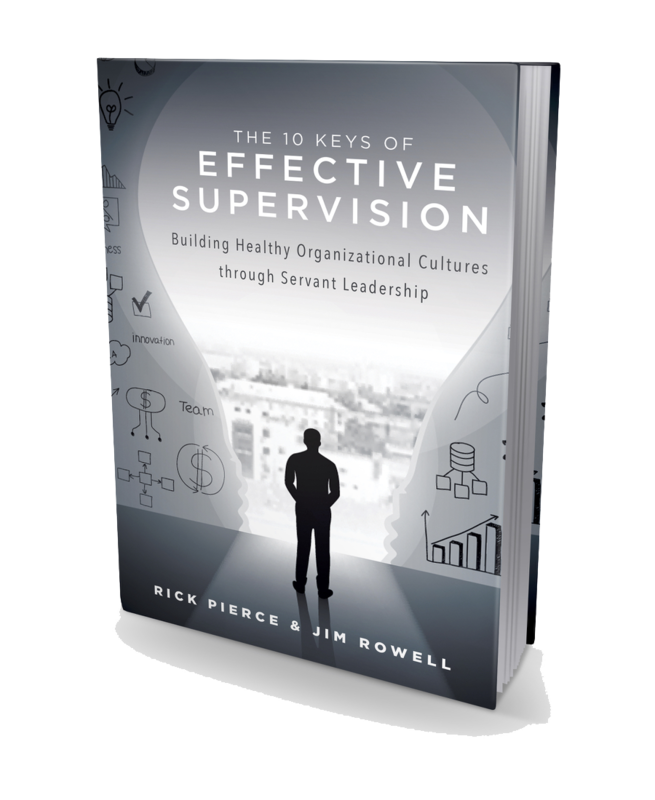 Our new book, The 10 Keys of Effective Supervision: Building Healthy Organizational Cultures Through Servant Leadership to Life, is the culmination of over ten years of study and research involving both our ongoing clients and the hundreds of participants in our seminars and workshops on the 10 Keys™.